LUCKY SEVERSON, correspondent: It has been described as a piece of heaven on earth, tucked in the foothills of the glacier topped Mission Mountains in northwestern Montana, a place where cows and farmers manicure the green grass. It is not a place you would expect to see a 24-foot-tall Buddhist statue of Yum Chenmo, the Great Mother of Wisdom and Compassion—certainly not in a land that has been sacred to Native Americans for centuries. STEPHEN LOZAR: This is where we live. This is where we were born and where the bones of our ancestors reside, so this is our home. SEVERSON: Steve Lozar is a council leader for the Salish Tribe. 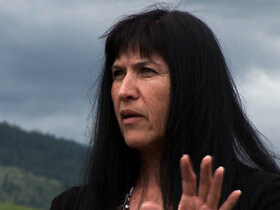 Julie Cajune heads the Center for American Indian Policy at the Salish Kootenai College. JULIE CAJUNE: The land around us, you know, is part of our creation story. The geography, the place names go back to our creation stories when coyote and fox went through this area and got this place ready for human beings. SEVERSON: One of those human beings turned out to be Tulku Sang-ngag Rinpoche, the highly respected Tibetan lama who says he saw this exact place in a dream when he was eight years old in Tibet. TRANSLATOR FOR TULKU SANG-NGAG RINPOCHE: And he says when he came here to this very site – little bit that site also – he says there was such an overwhelming sense of déjà vu, and it was as if he had seen it before, as if he had really known this place, and he talked to his acquaintance about it, and of course they convinced him that he had never been here before. Then he realized that this was the exact visualization that he had of America when he was a child. 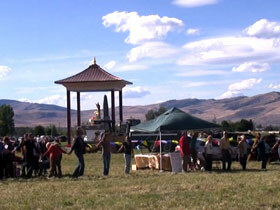 SEVERSON: So this is where Rinpoche supporters bought a 60-acre sheep ranch. It’s inside the confederated Salish-Kootenai-Ponderai Reservation. Because of a unusual hundred-year-old federal law, non-natives can acquire land within the reservation. 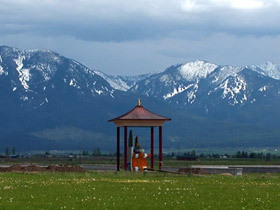 Guided by his vision, the Rinpoche determined that this was where he should build a Garden of 1000 Buddhas to promote world peace. Workers have been busy casting Buddhas for months, but it’s a slow process, and each Buddha must be perfect before it’s blessed. TRANSLATOR FOR RINPOCHE: This is the spine of the statue which has been cast. All these are scrolls which contain sacred Tibetan power syllables or mantras all with healing prayer, all that goes right in the cast. SEVERSON: Sitting in this old barn are hundreds of Buddhas waiting to make their grand entrance. The site is still under construction, but when it’s completed it will resemble the shape of a dharma wheel, which symbolizes the basic teachings of Buddha. At the center of the eight spokes is the statue of the Great Mother packed inside with sacred texts. But before the Rinpoche did anything, he wanted to make sure the garden of Buddhas was acceptable to the tribes. TRANSLATOR FOR RINPOCHE: And so he extended his hand to the tribal elders to come and bless the land. SEVERSON: Dan Decker is the lead attorney for the Salish Tribe. LOZAR: I actually was so excited I yelled out in the tribal council meeting, I think it’s a spectacular opportunity for cross-cultural associations that are peace-based, that are based in the holiness of this land. I can’t think of better possibility for neighbors. SEVERSON: It turns out that Tibetan Buddhists and Native Americans have quite a lot in common. TRANSLATOR FOR RINPOCHE: He gets a sense that, you know, there are similarities in our experience as oppressed people. He understands that once these particular areas were numerous with the natives, and their numbers have dwindled so much so that now they’re in the minority—a similar situation we may be facing in Tibet also. SEVERSON: In Tibet, the Rinpoche was revered as the sixth incarnation of one of the great Buddhist teachers. He was imprisoned for nine hard years, and he says he was tortured. His prominence did not sit well with the Chinese. TRANSLATOR FOR RINPOCHE: That’s what got him into trouble, because he says, from the Chinese perspective, number one they look upon religion as poison, something that is totally undesirable, and so if you were a religious person it’s almost the same as if you were like a drug peddler or somebody wh’os peddling something really terrible. CAJUNE: Another thing that we share with the Dali Lama and the Tibetan people is nonviolent resistance, and if you knew the history of our people, we have really been engaged in nonviolent resistance for hundreds of years. We’re still engaged in nonviolent resistance. SEVERSON: They also discovered a shared belief, that all natural things—the earth, trees, animals—have spirits dwelling within them. TRANSLATOR FOR RINPOCHE: In the Tibetan tradition, suppose you were embarking on a journey, and you saw an eagle overhead. You would celebrate, and you would look upon it as a good omen, that success is on the way, and he was amazed that the Native Indians have such a similar belief. SEVERSON: Now they share another tradition, an annual peace festival at a time when peace seems almost unattainable. Originally the Rinpoche planned to put a statue of Buddha at the center of the wheel, but after the terrorist attacks of Sept. 11, he decided instead to build a statue of the Great Mother with guns and swords buried underneath, symbolizing the victory of peace over violence. TRANSLATOR FOR RINPOCHE: He sensed that 9/11 may have planted a seed of conflict, enmity, hatred, and according to the scriptures, and according to his religious training, the Great Mother has that unique blessing to bring about peace, to reduce conflict. SEVERSON: And so now they dine together and share a dream that the Buddha garden will one day contribute to peace. 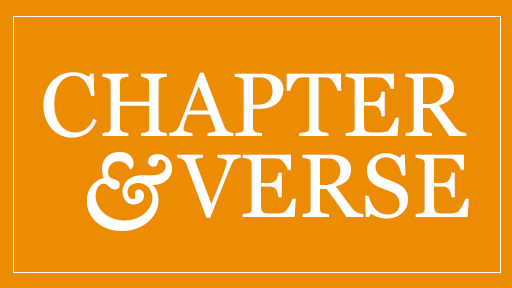 CAJUNE: There’s that old saying that says never underestimate what a single act of integrity can accomplish, and I really believe that that is what Rinpoche has done here. Something very good is going to come from it. SEVERSON: The Rinpoche says the Garden of 1000 Buddhas will be ready for visitors by 2014 and that the Dalai Lama has agreed to personally consecrate it. For Religion and Ethics NewsWeekly, I’m Lucky Severson in Arlee, Montana.